I've struggled for the better part of a decade to make shorts look cool. Chop a pair of pants off at the knee (or the thigh) and double the insecurities and the questions - how do I wear these to the office? Out to dinner? Anywhere that's not Coachella? The truth is: they really are just pants, the kind of pants with lots of potential - especially when you factor in the many styles to choose from. Biker shorts and athletic varieties will play a big part in the Spring '19 lineup, but so will longer, mid-length silhouettes and Bermuda shorts. Read: there's a pair to suit you just waiting to be styled. Need convincing? Read on for 41 ways to wear your shorts right, right now. Dress up a throwback look with heels. If you're feeling a little intimidated by shorts, know that the heels helps elongate and flatter your gams. Balance proportions and give biker shorts a chic finish with a puff-sleeve top. Throw a button-down on with your cutoffs, then give it all a boost with heeled mules. Give a shortsuit a shot and see just how sophisticated it can be. Pair short shorts with a blazer and flats to give them more polish. Top a pair of Bermuda shorts with a cropped top and style with boots for a look that goes beyond Summer. Slip into a pair of slides and add a blazer to make biker shorts more sophisticated, less sporty. A suit looks way cool in a laid-back cut. Denim shorts with a breezy tank will forever be a go-to outfit when the weather warms. Give jean shorts some edge with an asymmetrical or tunic top and pretty heels. Give biker shorts a minimalist vibe with understated pumps and a chic pullover. Polish up your short shorts with a tweedy blazer and flats. Reinvent sporty shorts with strappy heels and a tuxedo jacket. Khaki shorts never looked this cool. Edge them up with lace-up boots. Cowboy boots and a duster will transform your basic shorts. A sophisticated blazer and kitten heels makes these mid-length shorts office appropriate. Reimagine sporty vibes with a quirky button-down and dad sneakers. A duster and boots breaths new life into a pair of short shorts when the weather cools. Belt a coat over your shorts if you're feeling the need for more coverage. A romantic top instantly elevates a pair of shorts - especially when tucked in and belted. Warm up a pair of long shorts with a cozy sweater. High-waisted shorts are a chic alternative to a miniskirt. Lean into the sporty feel of your biker shorts with dad sneakers and a fanny pack. Remix a short suit with a pair of combat boots. 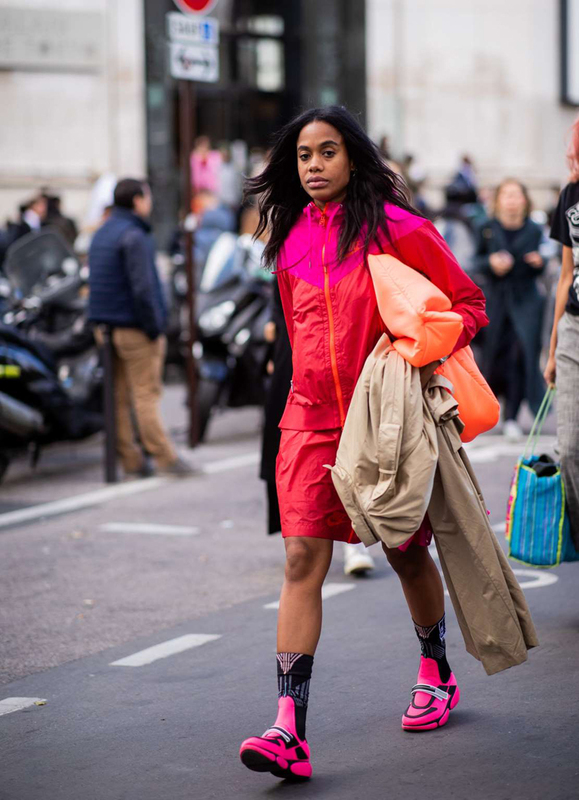 Go for the full-on sportif look in a coordinating tracksuit, then pare it down with a clutch and a trench coat. Biker shorts and a windbreaker look decidedly cooler with a fresh pair of ankle boots. Biker shorts are ultraflattering when worn with heels and a blazer belted to show off your waist. We're partial to boots, blazer, and biker shorts for a cool alternative to your weekend brunch look. Swap your pencil skirt for a pair of culottes if you're looking to refresh your nine-to-five style. Elevate gym separates with the right, statement-making outerwear. We love the simplicity of this all-black look, especially since the biker shorts add just the right outfit intrigue. Distressed shorts pair so perfectly with a well-worn sweater and heels for that effortless aesthetic. Keep it simple with a button-down in a bright hue and a well-fit pair of denim cutoffs. Remix your matching separates and opt for a pair of shorts with a coordinating trench coat. Swap denim cutoffs for a pair of tie-waist shorts that you can wear by day or night. Channel your inner Kim Kardashian in a luxe duster and accessories to dress up your basic bottoms. Give shorts a longer life when cold weather hits by layering tights underneath. Say yes to coordinates that look this cool, then finish with a coat and boots for transitional weather.